Long Punk Hairstyles and Haircuts. Do you crave for a Punk hairstyle, but still stick to your longer tresses? There's no need to cut your hair to sport a punk hairdo, instead look through the different ideas and accessories that would turn your plain strands into a smashing do. The latest trends offer endless options to shape long hair not only in spikes, but wearable, still original punk looks. Find out more on the latest long punk hairstyles. Punk hairstyles stand at the base of other hairstyling movements as Indie, Scene or Emo. In the past these hairdos were ideal to break with the traditions and even upset those who stuck to polished hairdressing. Shaved heads and spikes were only some of the accessories that defined punk hairstyles. Today there are no limits when it comes to finding the best punk look to our tresses. Instead of going into clichés, use your creativity to juggle with colors and cuts. This is what punk is really about, to flash your unique attitude towards what style and anti-style is. Pop punk, Skate punk and Death Punk are only some of the branches of the time-tested hairstyles. These all seem to embed some of the punkish elements into their own trends. The blending will give birth to new hairstyle trends. Short, medium and long hair is just as perfectly stylable with a few tricks. Hair was a top notch element to complete your outfit, that's why look at these long punk hairstyles to top your overall appearance and feel confident. Layered hairstyles especially perked up with a punk flair will earn standing ovation. These dos can be even sported by those punker girls who would like to keep the length of their tresses, but still crave for a new look. 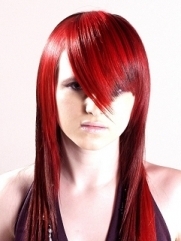 More, you can banish the boring look of the plain tresses with razored layers and even a shaved-head. These will all contribute to the unique punk hairstyle. Feel free to try out different hair highlights or a nice eye-popping block coloring. 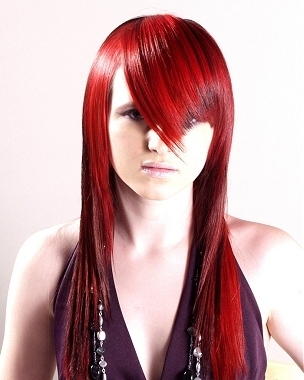 Red was always one of the top shades that would grab the attention of others to your dashing look. Make sure you use the proper hair styling products to emphasize the flipping tips and sparse colored streaks. Proudly living the revival of the styles of the past decades we must admit that the latest mullet hairstyles gain more and more territory among the fans of hybrid hairstyles. Short crops and long tresses live in perfect harmony especially when combined in a single groovy hairdo. Punk is all about denying the rules, that's why for guaranteed success go for the asymmetrical lines and layers. Use pomade or gel to shape the tresses on the crown area and add a versatile look to both the tiny and cascading strands. The best way to bring out the different forms and level differences is done by using a straightener. Bangs hairstyles flood the hair styling industry. More and more opt for this accessory in order to jazz up heir boring look. A punk hairstyle can be fabulously completed with a similar cut and you'll be bale to sport it either chopped or blunt. The secret lies in styling bangs in order to bring out the messy or the extremely geometrical look which is best achieved with chopped asymmetrical or ultra-straight and isolated tresses. Use your straightening iron to add the desired shape to your bangs and lean all the basic styling tricks.